On the other hand, the only patient that you have to worry about is you. When you take the initiative to learn about your diagnosis, and what sort of treatments and diagnostic tests are available, you can then help pass that information on to your doctor. How can you actually try to help educate your doctor about Marfan syndrome? Have readily available a summary about Marfan syndrome and information on how to get more details. For example, provide details on how to access The Marfan Foundation website, Marfan.org, and the phone number for the Foundation’s Help & Resource Center (516-883-8712 or 800-8-MARFAN, ext. 126). Because Marfan syndrome can affect so many body systems, keep track of which ones you know are affected for you. Additionally, keep track of what specialists you see, including their names and contact information. Have an updated list of what surgeries or procedures you have had. Family history is also often important because Marfan syndrome is genetic. Always bring a current list of all your medications, including the doses, to every appointment. Additionally let your provider know any other supplements or over-the-counter medications you are taking. Bring support. This can be a friend or family member who can help you keep track of your information and who can help you advocate for yourself. They can also assist in remembering details and other information that may be important for your doctor to know. Restate for clarity anything that you feel is not being understood or anything you have further questions about. Ask your doctor how they like to communicate when you are not in the clinic for a visit, such as phone, email, or online portals, as this can then enable you to provide further information to your doctor. Be patient. As a patient, is can be frustrating to feel that you know more about your condition (Marfan syndrome) than your doctor. Most doctors, however, enjoy learning about conditions with which they are not familiar. However, this can sometimes take more than one visit. When a doctor sees that you are interested in what’s going on with your health and that you have knowledge about Marfan syndrome, they usually become interested in exploring this further with you. Your relationship with your doctor is a two-way street. Not only does the doctor provide you with information, but you should also provide information so that you get the best care possible. Building a relationship based on trust and open communication with your provider is of utmost importance. 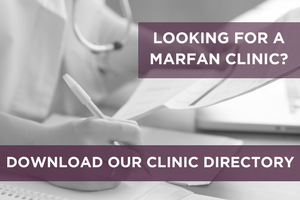 If your doctor is not receptive to learning more about Marfan syndrome and does not want to discuss any new information you have from the Foundation, perhaps there is a time issue and you can ask for a more convenient time to talk or schedule a follow up appointment. If the doctor still does not take your concerns seriously, it might be time to find a new doctor who you can partner with to achieve the best care for you or your family member.